The body is interesting, even in a resting state, as the body doesn’t ever truly stop. There are always subtle movements: shifts of weight, breathing, the unconscious balancing act, conscious feedback of where our limbs are at any given moment, blinking, and thought. To understand breathing, you have to know that gases travel from areas of higher pressure to areas of lower pressure. 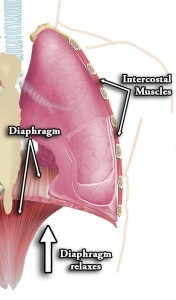 In the first stage of inspiration (breathing in): the diaphragm contracts and moves down and the intercostals contract. That means the rib cage rises and expands outwards where the diaphragm contracts. The larger volume in the lungs means lower pressure and the air flows in. 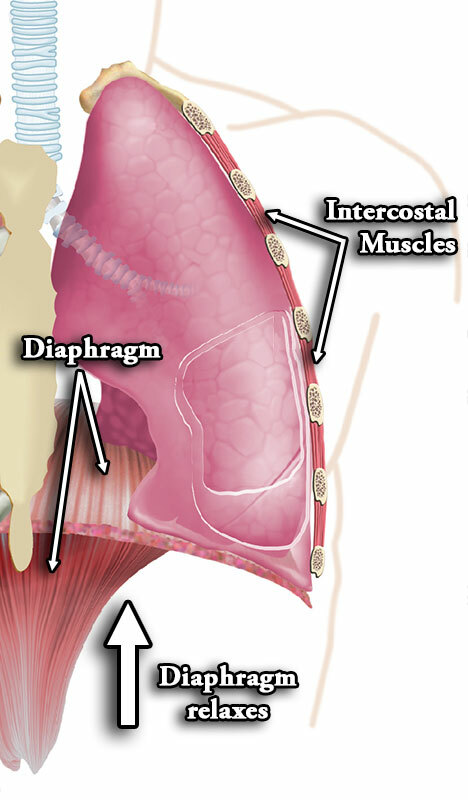 In expiration (breathing out): the diaphragm and intercostals relax so the rib cage shrinks back to a normal state. This returns the pressure to normal and the air that has been breathed in gets expelled as the lungs return to a normal state. In concentric contraction, the force generated is sufficient to overcome the resistance, and the muscle shortens as it contracts. This is what most people think of as a muscle contraction. In eccentric contraction, the force generated is insufficient to overcome the external load on the muscle and the muscle fibers lengthen as they contract. An eccentric contraction is used as a means of decelerating a body part or object, or lowering a load gently rather than letting it drop. In isometric contraction, the muscle remains the same length. An example would be holding an object up without moving it; the muscular force precisely matches the load, and no movement results. We have to be observers and notice things that most people never notice. As animators we need to observe and pay attention to the movement when there is no movement. We need to observe the distinction between conscious movement, unconscious movement, and movement caused by our anatomy. Muscles contracting involuntarily, trembling of limbs, air forcing the lungs to expand and contract, the blood pressure in arteries moving the fingers – when we are still our bodies are not, the autonomic systems in place make sure that we stay alive. The lungs increase in volume, breathing quickens, eyes start moving faster as they blink in anticipation and start focusing where the body will be moving to, muscles contract as the brain informs them that the body will be moving – This is not just for the preparation of an Olympic sprint, but even for the body simply getting out of the chair or starting to walk. The muscles start contracting from the origin of the moment i.e. the muscles around clavicle and the shoulder drive the action of throwing the ball, the elbow starts engaging as the muscles in the upper arm pull the the hinge up, the tendons start pulling fingers tight around the ball as the they start contracting from their origin behind the elbow, the muscles above shoulder and the clavicle engage even more to pull the the arm straight up. The body has started to slow the breathing as the blood starts flowing faster with the oxygen rich blood, the heart starts to beat quicker to keep up the supply to the muscles that are working. The eyes hold the gaze as the body gets more focused in the activity. Then the muscles engage to throw. The muscles tremble and spasm slightly as they stop contracting – they have done their job, performed the task that they were asked to by the brain. The body slowly returns to normal heart beat rhythm as the lungs return to the normal breathing rate. The muscles in the face might twitch slightly as the eyes track movement of the ball waiting the indication to move the body into a emotional state depending what the ball does. Though it would be interesting to talk about how muscle mass affects the body, now in animation terms you say that mass=weight, and if there is a heavier (i.e. ogre) model it walks slower… right? In real life it is not so straightforward. Let’s take for example a man with big muscles; he appears to walk slow, right? If we could see his muscles underneath his skin, they are in a contracted state. 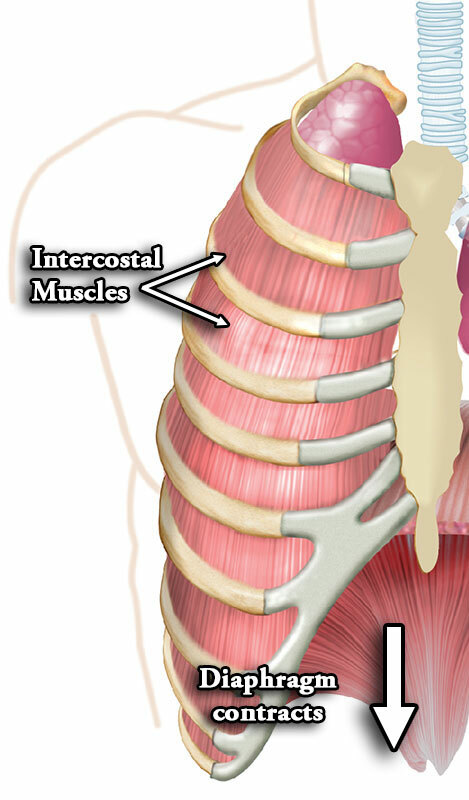 Muscle contraction happens all the time, but exercise can cause a muscle to stay in its contracted (shortened) state. When it is like this, a muscle will not move freely from contracted to a relaxed state. It looks like the man is stiff in his stride because that is what is happening; the muscles don’t relax and stretch away from the body. That is why he is walking slower; he is more bulky, so the mass is more than the weight in this instance, as muscle weighs more than fat. What happens if muscle stays in a contracted state? The muscle then stays in a shortened state resulting in loss of range of motion for that particular muscle and can result in changing the way that the body can move. The man with more fat than muscle has to swing his arms further and moves the torso quicker to get the momentum up to walk. His legs are always trying to catch up underneath the body in smaller steps than normal. The short steps are trying to balance the body mass more than a person of a smaller size. People that carry more weight don’t actually have less muscle, as you might think. They have to carry more weight with every step. It seems like the fat man is walking rather fast; which he is. It is just taking him longer to get anywhere. He needs to expend more energy with each action, mass=weight with the weight of fat being more than the weight of muscle on this person. The skinny man seems quite fast in movement to the others. He has no real mass (muscle or fat) and is quite skinny. It doesn’t take him long to move as the mass is not constraining his movement as much. Take note of this: if for any reason the muscle outweighs the fat or vice versa, the action would be slower as the muscle has to move the fat and the fat breaks down to feed muscle so therefore the skinnier guy would have a harder time moving if these weren’t equal. You are probably to the point in your animating that you have have the idea down that timing of the movement has to originate from the torso when moving… legs, arms, torso and the head have to take their direction from driving forces, thinking and balance as well as gravity and physics. But have you thought that because things weigh more in the body that they will take more time to respond to the movement and the force of the action? Swing your arm around.. and notice that the heavier upper arm even though the movement originates from shoulder will have different timing and different response to the force of movement compared to your very light hand. 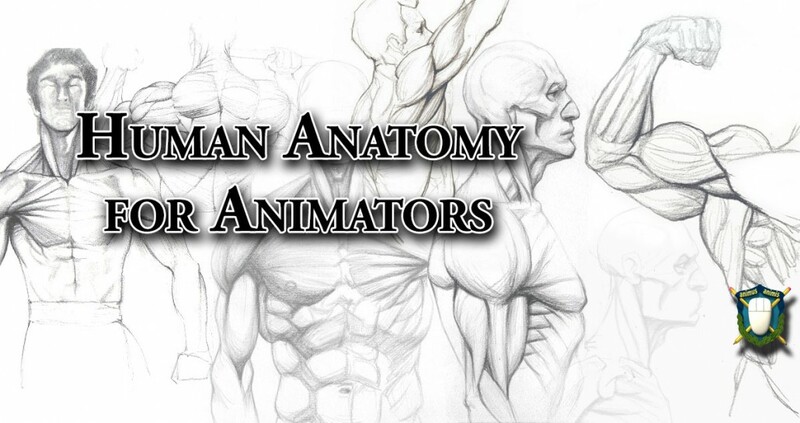 Hopefully that gives you a solid foundation of anatomy for your animation, and an understanding of how your anatomy affects the way you move. In our next article, we are going to look at the anatomy of walking.